Three-pin Plug is also known as a safety plug. 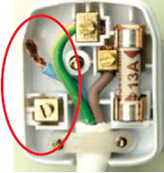 The cartridge fuse protects the appliance when there is an electrical fault. The earth wire protects the user from electric shocks in the event that an electrical fault causes the appliance to be live. 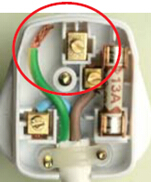 Mistake: This plug does not have a fuse. 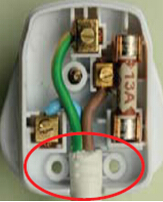 Effect: Without a fuse, the live wire in the cable is not electrically connected to the live pin so appliance will not work. Mistake: The earth wire is not connected to the earth pin. Effect: The metal casing will be “live” if the live wire touches the metal casing. The fuse will not blow. Mistake: The neutral wire is not connected to the neutral pin. Effect: The circuit is not completed, so appliance will not work. Mistake: Both the earth wire and live wire are bare. Effect: If these wires touched each other, it will result in a short circuit and the fuse would blow. 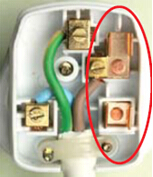 Effect: If the cable was pulled, one or more wires could become detached from their pins and the plug could no longer work or could be dangerous.